I had some fresh zucchini from my Farmer’s Market box last week that I needed to use so I went searching online and found this super easy raw food recipe for Lemon Dill Zucchini Chips. 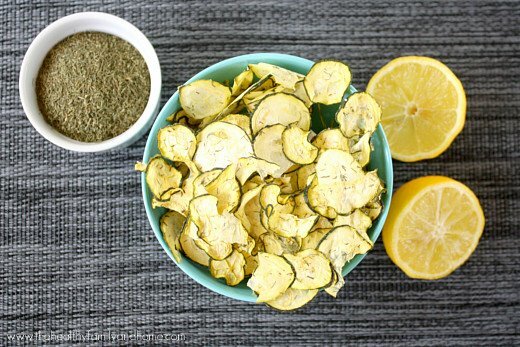 I used half of my fresh zucchini to make some Raw Zucchini Walnut Crackers and used the other half to make these Lemon Dill Zucchini Chips. This was the first time I used my hand-held mandolin slicer and I sliced the zucchini very, very thin (on setting #1). Every other time I’ve dehydrated vegetable chips that were cut by hand, they were either too thick or took too long to dehydrate. So these are almost paper thin as opposed to the ones a little thicker in the original recipe. The dill taste is very subtle, but there is a strong lemon taste that makes them very tart…and I like that. You can use either fresh dill or dried dill weed. I’ve used both and it was good either way. And, they are not very salty at all and are actually a nice change from regular salty vegetable chips. I love my Excalibur Dehydrator because it’s a great way to get your children to eat healthy, raw snacks that are full of live nutrients. This healthy recipe is raw, vegan, gluten-free, dairy-free, nut-free, soy-free and paleo-friendly. Want more healthy snack recipes? Check out Habanero Kale Chips, Roasted Chickpeas with Chipotle and Lime, Healthy Oven Baked Green Tomatoes or my Clean Eating Cookbook with an entire chapter of 20 healthy, clean eating snack and side dish recipes that you will love! 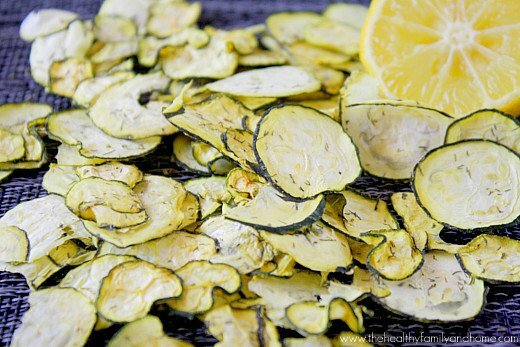 Tip #1: If you don’t have a dehydrator to make these, you can use your oven at the very lowest setting for approximately 2 hours, or until they become crispy. Line a baking pan with parchment paper and spread them evenly. Since a dehydrator will easily remove all the moisture from the zucchini, you may want to help speed up this process using the oven baked method by pressing the zucchini between paper towels to remove some of the moisture. Leaving the skin on, slice the zucchini very thin by hand or with a mandolin slicer on the thinnest setting. 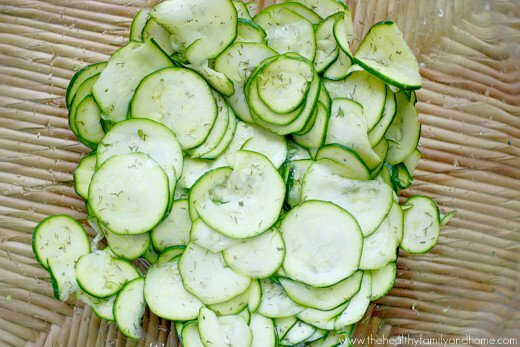 Add the zucchini slices to a medium-sized bowl and add the fresh dill, lemon juice and salt. Toss until all the zucchini slices are covered with the lemon juice mixture. Adjust seasonings to your preference. 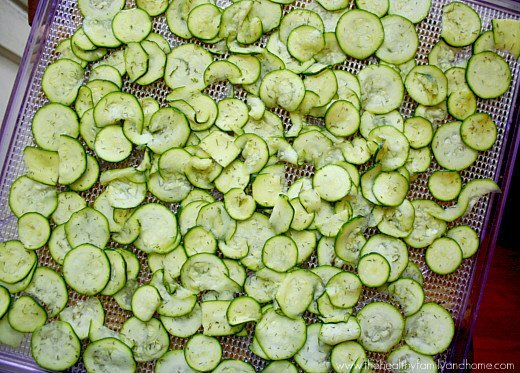 Spread the zucchini slices evenly on a mesh tray of your dehydrator, making sure none are overlapping. Dehydrate at 115 degrees for 10-12 hours, or until crispy. Store in an air-tight BPA-free container or they will get soft if left out to absorb moisture from the air. The photographs for "Raw Vegan Lemon Dill Zucchini Chips" by Karielyn Tillman of The Healthy Family and Home website are licensed under a Creative Commons Attribution Non-Commercial No Derivatives 4.0 International License and cannot be used without my written permission. I was wondering if you ever tried “drying” out the zucchini by letting it sit in the sun or just letting it sit on the counter for a couple hours until the surface of each chip is no longer so moist? I was curious because my mom sun dried some apple slices before and it almost came out like a chip when we left it out long enough. I think I might try to do this and let you know how it goes! Hi there! No, I sure haven’t. But I know you can dehydrate things outside in the sun (in a mesh type device to keep bugs, etc off the food) as that’s how original dehydrating was done. Made these as my first dehydrator recipe!! YEAH!! they turned out spectacular! I’m SOOO excited to try more things; especially crackers! Bless You & Yours Karielyn & Thank You for all Your hard work! Hey Karielyn, You mention You made raw zucchini walnut crackers with some of Your zucchini in the comments on this page but search as hard as I can, I am unable to locate said cracker recipe. I was hoping to make some with some of my zucchini 😉 Never thought I’d say that years ago… but now! I use tons! Thanks to You! Hi there Becky! I’ll try to get that Zucchini Walnut Cracker recipe up for you in the next day or so. I just bought some zucchini and walnuts this weekend so I have everything to make them. I know frying would take away on the healthy part, but so u think that would work just as well? Hi there! If you are unable to make them with a dehydrator, I would try the next best thing which would be to bake them in the oven. Try doing a google search for “oven baked zucchini chips” and I bet you will find out that would work. 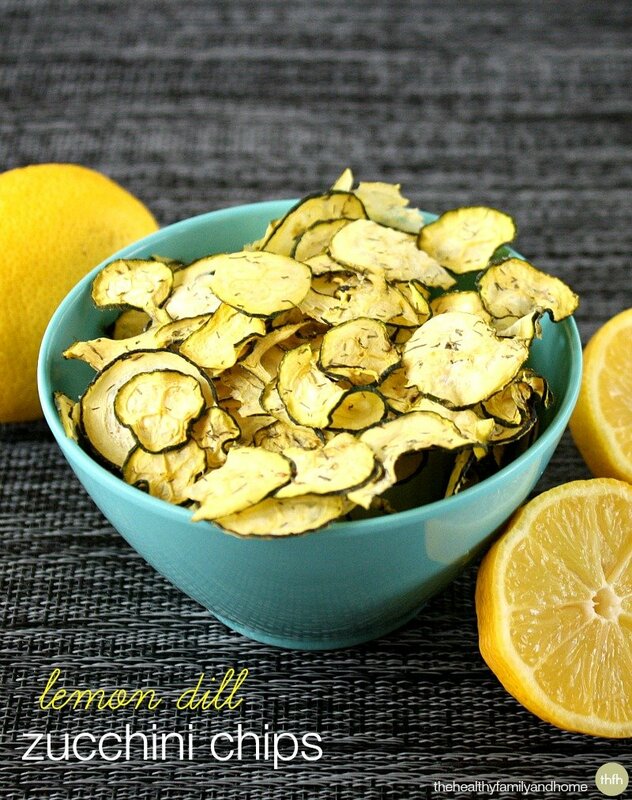 I don’t have a dehydrator or a mandolin, but I’d love to try this recipe? Would a food processor with the “sliceer” blade make the zucchini thin enough? Without the dehydrator, would it work if I pop them in the oven at 200F for an hour or so? In the meantime, I’m headed to the store for zucchini! Thans. Hi Darla! I’m excited that you want to try out the recipe! Don’t worry about the mandoline slicer…you could either try the slicer blade on a food processor or cut them very thinly by hand. The first time I made them, I cut them by hand, then later started using the mandoline slicer. They have to be very thin when using the dehydrator so it may not be as big a deal in the oven. 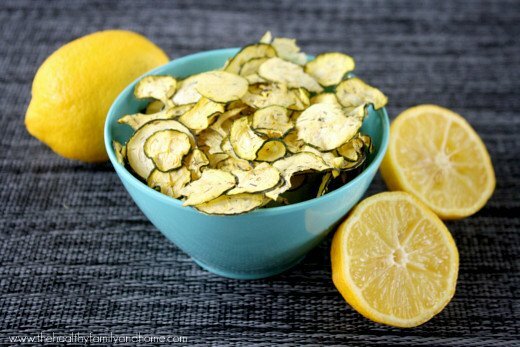 I’ve never made plain zucchini chips in the oven (I’ve made Oven Baked Zucchini Chips in the oven – recipe here: https://thehealthyfamilyandhome.com/vegan-oven-baked-zucchini-chips/) but I would try them at the very lowest temp, maybe leave a little crack in the door and keep a close eye on them. I’d also flip them over about halfway through. They shouldn’t have to bake for very long, especially if you slice them thin. They may or may not get crispy like in the dehydrator though. 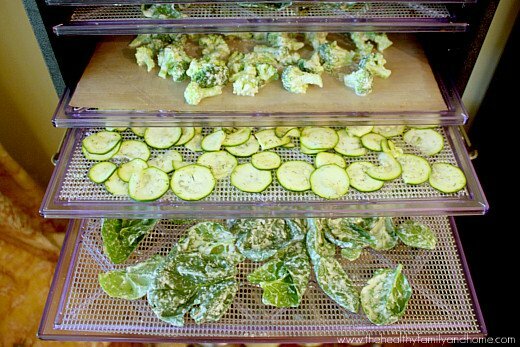 The dehydrator takes all the moisture out of them and that’s what makes them crispy. You may want to drizzle a very light coat of olive oil or coconut oil on them and that might make them a little crispy. Maybe follow the recipe above, but without the almond milk and coating. Your recipes are amazing and I can hardly wait to make many of them. I like the 5 Fast Facts that you present as well. I would like to share these at my culinary classes. Thank you so much for sharing with all of us!!! Hi Debbie! Thank you so much for your kind comments! I’m glad you like the “5 Fast Facts” and I like to show them because I’m hoping it will help my readers to think about what is in the foods they are eating and more importantly, what’s not in their foods (the bad things). Would it matter if I used yellow squash instead of zucchini? Hi Heidi! 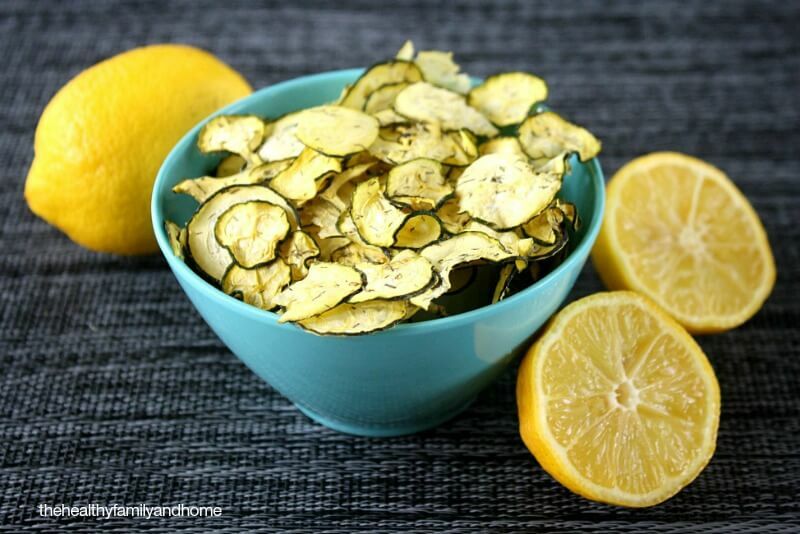 Yes, you sure could use yellow squash…I’ve actually made chips with those before myself! Just make sure you cut them really thin, like with a mandoline slicer. Neat idea for zucchini. Were those spinach chips underneath, too? Hi Janet! Yes, it actually was spinach! I had made a Creamy Habanero Dressing and had an idea to make some Raw Spinach Chips and Raw Broccoli Chips with it so I dehydrated them at the same time I did the zucchini chips. I’m going to have to check out your beet chips…I’ve never made beets yet and love the ones from Whole Foods. Yum! What a great idea! I’ve seen so many different types of chips but I think this is a great idea, I imagine they get nice and crispy and absorb any flavor you add to them, nicely. Thanks for sharing! Hi Marquis! I love all different kinds of chips made in my dehydrator but I think these are my second favorite, only behind kale chips.